(Phys.org)—Amelia Carolina Sparavigna, a physics professor with the Politecnico di Torino in Italy has found that the gates that once led in an out of an old Roman fortress in north-west England aligned with the summer and winter solstices. She has also noted that the towers built on each of the corners were aligned with the cardinal directions. She has published her analysis, results and ideas on reasons for the alignment in her paper published in Philica. The old square-shaped fort sits on top of a hill close to Hardknott Pass situated in Cumbria County overlooking the Eskdale River Valley. It was built by Roman soldiers and workers sometime before 138 A.D. as it was commissioned by Hadrian, who was ruling the empire at the time. It is mostly ruins now, but was once the site of a garrison, housing approximately 500 men. It was subsequently abandoned in the mid 2nd century during the Antonine push into Scotland and was thereafter occupied and abandoned repeatedly over the years since. Sparavigna took an interest in the fort and used software she found online to work out the fall and rise of the sun on the fort during each solstice, and then Google Earth to compare what she had found with the fort's features. 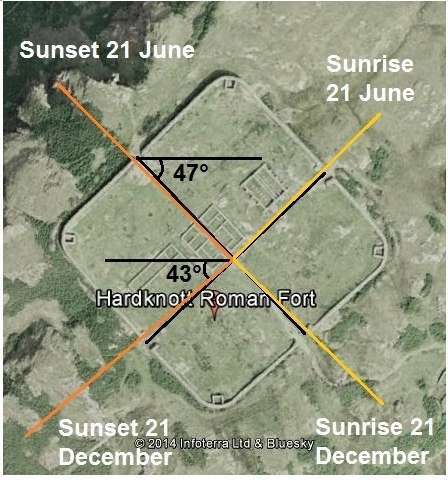 That led to the discovery that the fort is aligned such that when the winter solstice occurs, the sun, when it came up, would line with certain gates, and would set lined up with other gates. During the summer solstice, on the other hand, the sun tended to align with different gates during sunrise and/or sunset. Sparavigna cannot say for sure why the fort is aligned the way it is, but suspects it has a lot to do with the gods worshiped by the Romans at the time, noting that many buildings and communities were aligned in similar manner during Roman times. Of course it also seems plausible that the alignment with the sun was an unintended consequence of the cardinal alignment of the walls, or it could have served a more practical purpose—maximizing the amount of light that entered the fort or helped to best see enemies approaching during different times of the year. From the most ancient times, the Roman military camps were planned according to a certain ideal pattern that was also applied to the coloniae, the outposts established in the territories conquered by Rome. The planning of castra and colonies was based on a chessboard of parallel streets, the main of them being the Decumanus. Probably, some Decumani were oriented to confer a symbolic meaning to the place too. Here we discuss the distinctive layout of a castrum in the Roman Britannia, the Hardknott Fort, and its orientation to the solstices. How about it simply kept the sun from being directly in peoples eyes when they were entering and leaving the fort except on just a couple days of the year! The angles might be important for telling them how far north they were relative to other Roman posts in other parts of the world. Wait there - Sun in Cumbria which is traditionally one of if not the wettest place in the UK. Knowing the Romans this would have been a very good reason indeed. If some legionaries belonged to a religion that practised sun-worship of any kind they would have been pretty well able to do so by themselves without having to force the rest of the troop to build their fort in a given way. Now if all forts constructed by the same 500 man troupe are aligned that way then that might be an argument. But with one data point that is a very tentative hypoithesis.